If you know anything about me…you’ll know that I am a HUGE soccer fan. While I never played soccer myself, my love of the game goes back to 1994, when my parents took my sister, brother and I to a World Cup Match at Giant’s Stadium. I was hooked ever since then. Four years ago…Louisville, Kentucky got a USL soccer team, and my roomie, my friend Patrick, and I went in for season tickets…and we splurged. Midfield. Patrick moved away, and our friend Natalie took over his tickets. And for the past four years…we have been dedicated to our Boys in Purple! Around this time last year…Louisville City FC…our USL soccer team…won the USL Championship Cup. It was years in the making, as we had made it to the USL Eastern Conference Finals the previous 2 years and to FINALLY get the win and put them into the Championship…was a thrill. We took our friends Melissa and Paul. And…with 90 minutes gone, Cameron Lancaster buried one in the net, keeping us from extra time, and…dreaded penalty kicks. We won. Paul, Me, Cathy, & Melissa after Louisville City FC won the 2017 USL Cup Finals! This year, our beloved team had it’s share of ups and downs. For one thing, we lost our coaching staff about halfway through the season. We had three players step up to be player coaches until the positions could be filled. We had a bunch of injuries. And on a small roster, that has an impact. We had to get used to a new coach and his way of playing. We lost games we should have won. We won games we expected to lose. The team knew what it needed to do to get back to the playoffs again, and they did it without egos. And that, is one of the many reasons I love this team. Last weekend, while I was in Indianapolis preparing to run the Indianapolis Monumental Marathon…Louisville City beat the New York Red Bulls II and became the Eastern Conference Champions…for the second year in a row. On to the finals. The Western Conference Champions this year…Phoenix Rising. Headed by none other than Didier Drogba! HOLY CRAP. BUT…our usual battleground, Slugger Field, has an event happening the day ESPN chose for the match. So…the game had to be moved…to a smaller venue. Tickets sold out in 20 minutes. Thankfully, as a season ticket holder, I was able to snag two tickets ahead of general sale. They added temporary bleachers to the stadium for this match to allow for a bigger turnout. But it was SOLD OUT and the seats were packed. Despite the cold night. I arrived, ready to see our team take on Phoenix Rising…and Drogba himself. It was an honor to be able to watch him play. The entire match was intense. I normally take videos on my phone, but not last night. I didn’t touch my phone. And that’s not just because I was wearing two pairs of gloves on my hands, two pairs of socks on my feet, and four layers on my upper body. No joke. I was NOT going to freeze out there. The first half came to an end…with no goals scored. Luke Spencer scores an incredible goal putting us ahead. Now…we just had to hang onto it. The stadium was pure electricity. Lots of stomping, cheering, clapping, screaming, it was magical. And stressful. Because every time Drogba was given the ball (it seems Phoenix’s entire game plan was…get the ball to Drogba), and he took a shot, I think we all collectively held our breaths. Yellow cards were issued. Substitutions were made. Stoppage time was played. And the final whistle blew. And Louisville City FC made HISTORY last night by being the first USL team to win back-to-back championships. Damn…that was fun. It also meant that my roomie and I stayed to watch the award ceremony, waited to see if the players made the rounds…and then called it a night. We walked back to the car, just buzzing with sheer adrenaline from the win. It was amazing. God, I love this team. Proud to be a founding member. It was a late night (which included a Burger King drive-thru stop for my roomie as she was STARVING)…but we got home and I went into my room and called it a night. I had a spin class to get to the following morning. I was glad I went, but damn, it was very hard to get myself out of bed when my alarm went off this morning. Any of my local peeps attend Louisville City FC matches? Are you season ticket holders? For those of you who don’t live in or near Louisville, what sports are you into? Did you play that sport as a kid? What teams do you support? I want to know!! For now…just riding the celebration wave into the weekend. Much love for another fantastic season, Louisville City FC! Cathy & Me at the USL Cup Championship Finals at Lynn Stadium in Louisville, KY.
Back in November, when I ran the TCS New York City Marathon, my friends and I celebrated my finish by going out to eat…at Marcus Samuelsson’s restaurant, Red Rooster, in Harlem. Amazing meal and amazing experience. When my server came to the table, we explained that we were celebrating my completion of my final marathon of the year and then mentioned my food allergies. He said he would go speak to the chef. The chef was also a marathon runner and asked if he could create a dish for me. I never turn down this opportunity. I love it when chef’s get a bit creative with the ingredients they have on hand to produce a dish off the cuff. I was more than happy to allow him to do so. 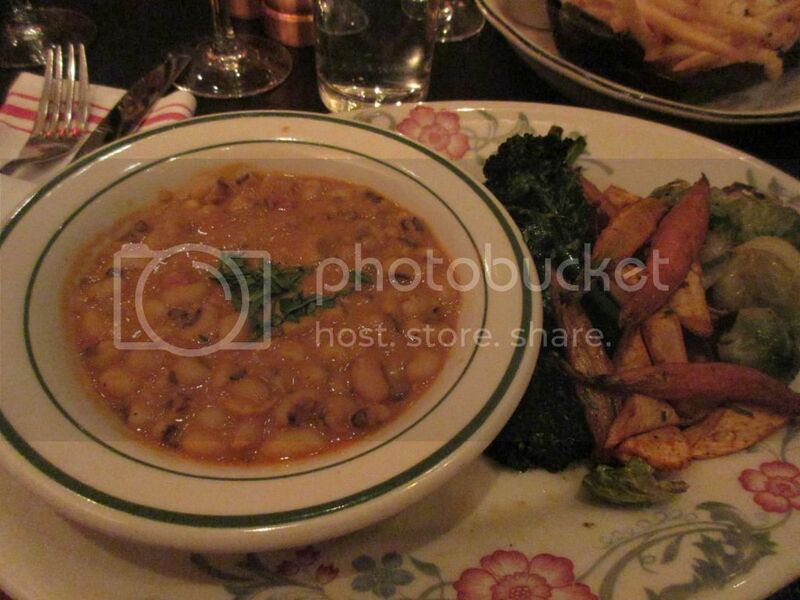 One part of the dish was this amazing curried black-eyed pea dish. I was beyond impressed. So, naturally, I went hunting online for a recipe. And while this is not the exact dish that I had at Marcus Samuelsson’s restaurant, this was one amazing dish. One I was beyond happy to cook up. I made a few minor tweaks, substituting the cilantro with collard greens. I also used dried ginger instead of fresh. The habanero is important. It adds sweetness and a bit of heat (but it is seeded, so not too much!). Do not leave it out. Also, invest in berbere seasoning. It is my favorite spice on my spice shelf at the moment. In a large saucepan, cover the peas with water and bring to a boil. Simmer over moderately low heat until tender, about 40 minutes. Add a generous pinch of salt and let stand for 5 minutes, then drain well. Meanwhile, in a large saucepan, melt the butter. Add the onion, ginger, garlic and chile and cook over moderate heat, stirring occasionally, until softened and just starting to brown, about 10 minutes. Add the berbere and turmeric and cook, stirring, until fragrant, about 2 minutes. Add the tomatoes and cook, stirring, until softened, about 5 minutes. Stir in the coconut milk and stock and bring to a boil. Simmer over moderately low heat, stirring occasionally, until the tomatoes break down and the sauce is thickened, about 20 minutes. Add the peas to the sauce and cook over moderately low heat, stirring, until the peas are lightly coated, about 10 minutes. Fold in the collards and serve. This definitely had a bit of bite to it. I almost thought it would be too spicy for my roommate, but she said that she could just handle it. I absolutely loved it. Definitely not the dish I had at Red Rooster, but amazing and delicious all its own. And with the New Year almost here, it is often considered lucky to have black-eyed peas and collard greens on New Year’s Day in the South. So, here is an easy, delicious dish where you can enjoy both in a new and different way. I have the leftovers in my freezer. Can’t wait to enjoy it again at a later date. I totally broke tradition. I did. 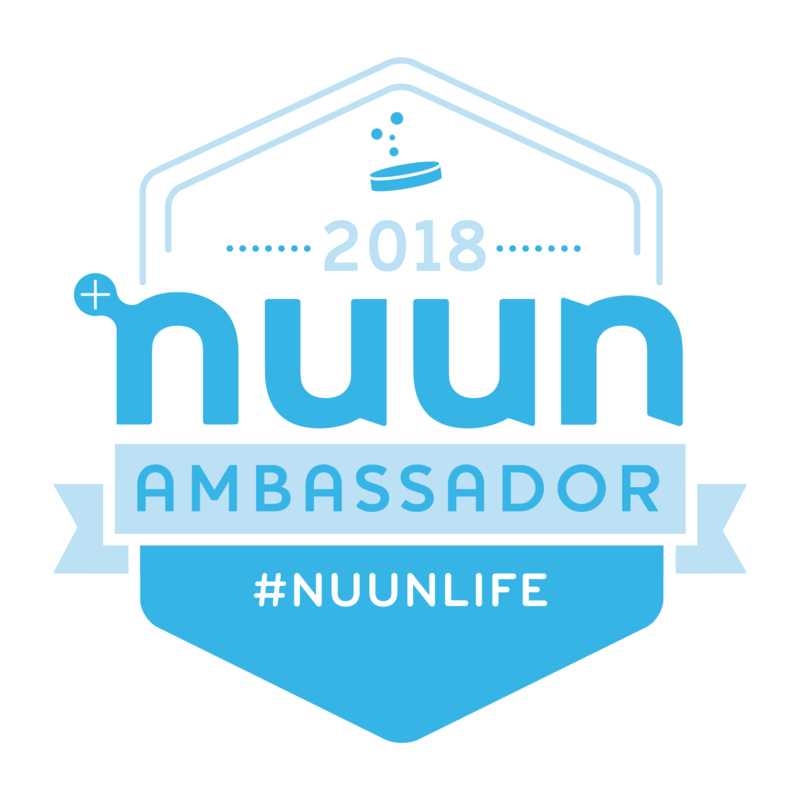 I was in New York City to run the TCS New York City Marathon…and so far I had managed really amazing gluten-free pizza the night before the race. Normally, after I race, my friends and I go to a pub to celebrate the occasion. But, it was of my own doing that we ended up in Harlem just after 6 p.m. on Sunday evening. Well…since we were going to be in New York City, I thought it might be fun to check out a restaurant that belongs to one of my favorite chefs of all time. After all, we were celebrating my finish at the marathon earlier that afternoon. Why not make it special. So, yeah…I broke tradition and decided to forgo the pub for something…a little different. And I have never made a better decision in my life. Prior to heading to New York City, I had told Cathy that I really wanted to go into Harlem and eat at Red Rooster. She knows how much I adore Marcus Samuelsson. And, honestly, we’re both foodies…she was right there with me. So, she went ahead and called the restaurant and talked to them about reservations on marathon eve. She mentioned that I was a gluten-free vegetarian and they said that food for me would not be an issue. With that done, Cathy set up a reservation for 6 p.m., giving me plenty of time to run, shower, walk around, come back and change, and get there with my group of friends. We had reservations for 4 people…me, Cathy, Heather, and my good friend Marisa. So, that night, I dressed up in this elegant vintage dress…but kept on my recovery compression socks (and wore them with my heels, HA! ), and my three friends and I went down to the subway and hopped the train to Harlem. We emerged steps away from Red Rooster. Literally. And about 10 minutes late. Whoops. But…we got there…before they handed our table away. We were seated near the kitchen, which was fantastic for me because I could see the people bustling around in there, working hard at the various stations. 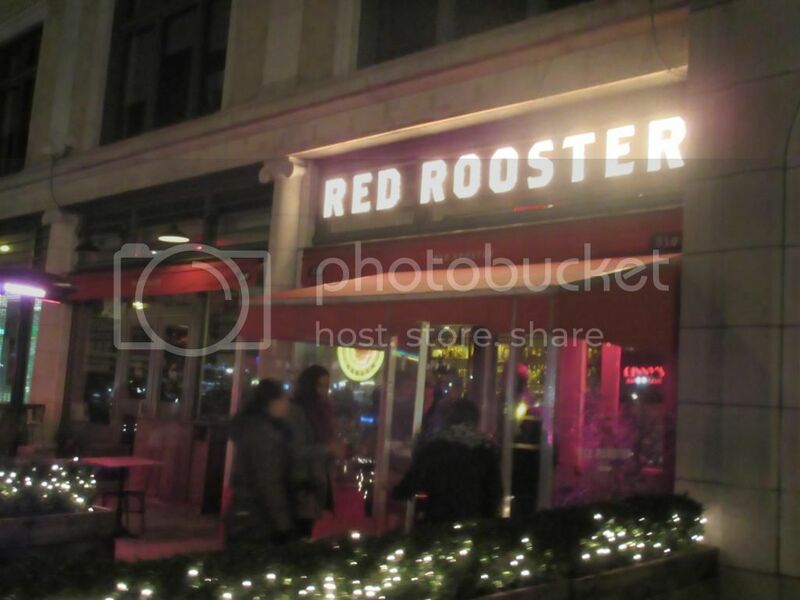 I loved the feel of Red Rooster…very chic casual. A fun, vibrant, laid back, but classic vibe. It was the kind of place I would want to return to and bring everyone I know…at least once. Totally my style. Our server, Ryan, came over to greet us. He said that if we had any questions regarding the menu to let him know. I mentioned that I was a gluten-free vegetarian, and he said that wouldn’t be a problem. In fact, he would go and talk to the chef and see what they could do for me. I thanked him and we all studied the different menu options. At one point, I know Cathy was trying to convince Marisa to try the soup with tripe in it, but that wasn’t happening. Ryan returned, and said that he mentioned that I had run the TCS New York City Marathon and was a gluten-free vegetarian, to which he said the chef would like to create a dish for me. I was thrilled and thanked him for checking. With that said, Cathy took one matter into her own hands. We were, after all, celebrating. So, she ordered a bottle of wine for the table. We went with a sweet wine (Heather prefers dry…but she was a good sport), opting for a local Riesling – the 2013 Brotherhood from Washingtonville, New York ($48.00). We were ready to order, it seemed. Ryan already had mine. He said the chef was going to do up a Vegetable Plate ($21.00) for me. So, I was excited to see what would emerge from the kitchen. Cathy went with Marcus Samuelsson’s signature dish – Helga’s Meatballs, which are served with lingonberries, braised green cabbage, and buttermilk mashed potatoes ($23.00). Heather ordered the Triple-Double Burger, which is served with bacon, jarlesburg, and rooster sauce ($19.00). Marisa did a little picking and choosing, and went with the Upstate Farms Squash Soup, which includes yogurt, honeycrisp apples, and lentils ($12.00) with a side of the Cornbread ($4.00). 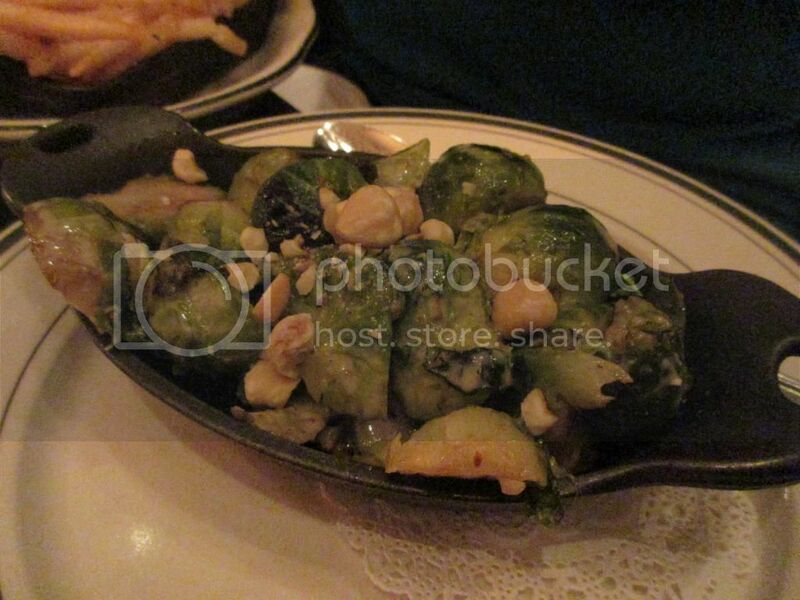 And, because they sounded good…Heather and I split a side of the Hearth Roasted Brussels Sprouts ($8.00). Ryan went to put or order in and we all got down to talking about New York, about work, about life, about the race, about food, about events…whatever we wanted to talk about. We were in no rush and the restaurant was not rushing us. I loved being able to just drink in the atmosphere. Just before the food arrived, Ryan returned with our Riesling bottle, pouring a little bit into Cathy’s glass. Cathy lifted the glass and took a sip. And it was love at first taste for her. So he poured some in each of our glasses, and I made sure to keep drinking my water too. No dehydration here. And then…our entrees arrived, each one settled down in front of us carefully. The chef created a fantastic dish for me. 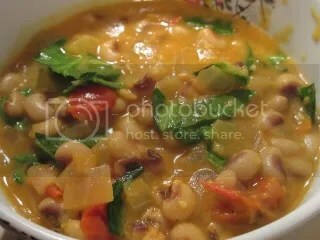 In a bowl on my left was Curried Black Eyed Peas. And on the platter beside it…Charred Broccolini, Berbere Carrots and Parsnips, and Roasted Brussels Sprouts. Oh…I will note, these Brussels Sprouts tasted different than the side that Heather and I were splitting. It was chef magic. And it was a beautiful and gorgeous plate. One that I looked forward to eating. Let’s start with the Curried Black Eyed Peas. Just…WOW. WOW! So much flavor. Lots going on. And yet…simple. I like to traditionally have black eyed peas on New Years Day…and this is how I would want them this year. For real. Just this incredible depth of flavor with the curry spices. Not hot…just simply bringing out more of the peas themselves. One of the best dishes involving peas of any sort I have ever had in my life. And, trust me, I’ve eaten plenty. The vegetables that the chef prepared were a delicious and filling treat for me. The broccolini was gorgeously cooked and vibrant green. It had the right amount of crisp to it, yet, still soft and easy to bite through. I love broccolini, and this was just as it should be…simple and delicious. The Brussels Sprouts were roasted to perfection, giving that outer layer some depth of flavor, yet keeping the vegetable itself soft on the inside. Fork tender perfection. My favorite thing, however, on that plate was the Berbere Carrots and Parsnips. HOLY COW! This side is exactly why I rushed out to a spice store in order to purchase berbere. This spice is awesome. It has this great flavor to it, followed with a little bit of heat at the end. It paired beautifully with this root vegetables. In fact, these were what I saved for my last bite. Completely in love with a plate of vegetables. How amazing! My compliments to the marathoning chef. My meal was sheer perfection. And I know you’re wondering about the Hearth Roasted Brussels Sprouts that Heather and I split, right? Of course you are! These were different from the ones that were on my plate. These sprouts had this amazing char to them, but also hit up with a bit of a lemon or citrus flavor. Sprinkled on top were macadamia nuts. It was a combination that I hadn’t had before with Brussels sprouts…and I liked it. Because when we celebrate we get dessert too! We were handed the menus so we could peruse the options. Ryan was taking care of another party at that moment, so I asked the new server about gluten-free options. She highly recommended The Green Apple Viking Delight ($11.00). I was game. Heather actually ended up doing that too. Leave it to the Scandinavian Minnesotans to order something with the word “viking” in it. HA! Cathy knew she wanted to have cheesecake in New York City, so her choice was the obvious one…Vanilla Cheesecake, served with yogurt, a granola crumble and pomegranate sorbet ($11.00). Marisa went for the signature dessert of the restaurant, the Red Rooster Doughnuts, which are filled with sweet potato and coated in cinnamon and sugar ($12.00). It came with an icing to dip them in as well. Desserts arrived shortly after and…yeah…we were quite happy with our choices. I thought The Green Apple Viking Delight was like a cold crème brûlée. 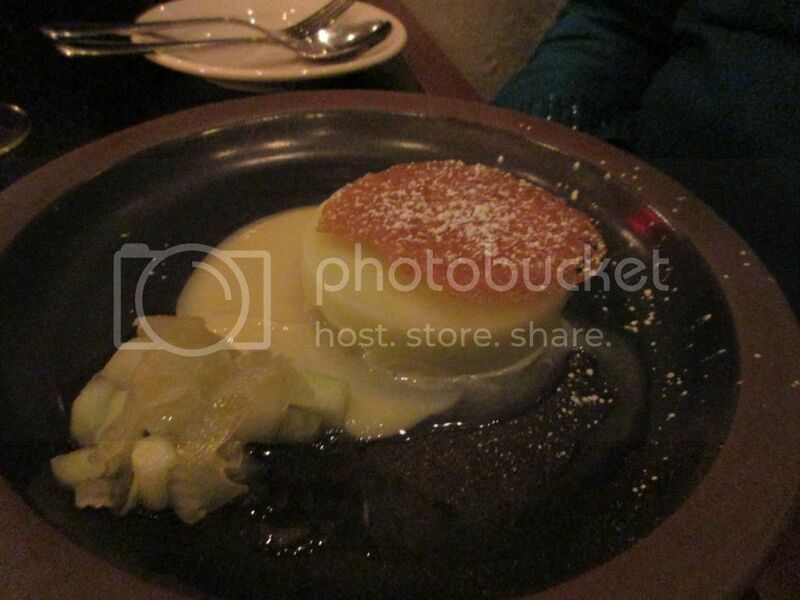 It was a green apple sorbet set on top of a white chocolate fennel cream. On the side was chopped apple and fennel. And a little tuile was set on top, giving it a little crunch and texture. I was totally in love with the flavors, even though I wasn’t completely certain, at first, that they would work. They complimented each other perfectly and each bite was a burst of sweetness, with a bit of richness from the white chocolate. Divine. Cathy loved her cheesecake (it looked deconstructed…so cool!) and Marisa was more than pleased with the doughnuts. Needless to say…we are girls. Desserts are awesome. But these…these took awesome up to the next level. Which I guess is phenomenal. Or, in the culinary world, a sweet note to end the night on. We left the restaurant completely satisfied with the meal. 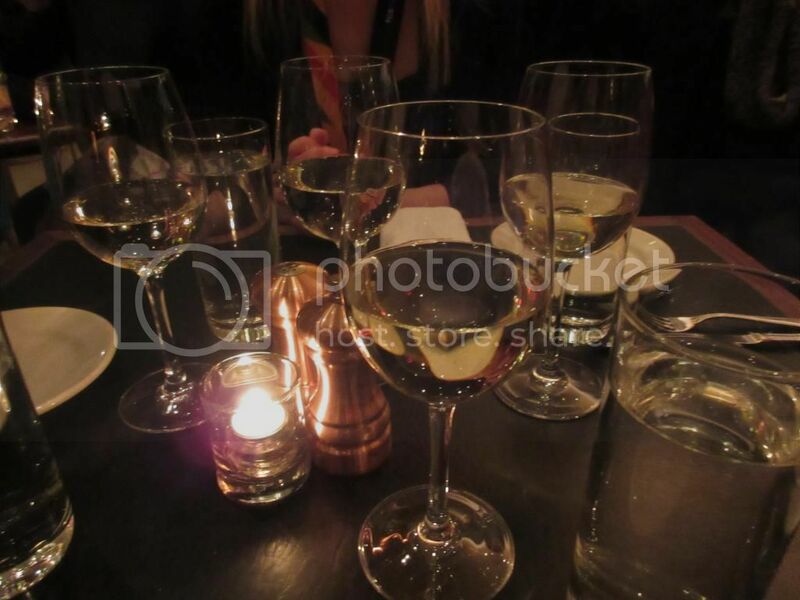 The ambiance of Red Rooster was like no other restaurant that I have been in to date. A live jazz band had started to play during our desserts and we really just took a moment to not only savor the food, but savor the experience as well. I have been a Marcus Samuelsson fan for years…being able to eat at his restaurant was a dream come true. Having a dish created for me, and having a careful and very caring staff made it unforgettable. I was congratulated so many times on finishing the marathon. It was an amazing day, but that night really just sealed it as one of the best days of my life. Good race…good friends…good food…good times. Thank you, Marcus Samuelsson and Red Rooster. I admit it. I’m a girl from the North, so when my CSA bin arrived with collard greens inside…I had NO clue what to do with them. None. And while I lived in Birmingham, Alabama for six years…I was never one for southern-style cooking. Just ask any of my friends and co-workers. I was not having any of it. So…collard greens had me stumped. So, I did what any good Northern girl would do when staring at collard greens and trying to figure out a good way to use them before they went bad (because we waste NOTHING!). I hit up Pinterest. And…much to my delight, found a soup recipe (and I love soup!) that incorporated collard greens and pretty much (save for a red onion and an extra box of organic veggie broth) everything I already had in my pantry. Seriously! So…I figured I would give it a try. Let me tell you…this soup is so easy to make. One pot. That’s all you need. I used my Dutch oven to cook everything up and it was just…easy. And smelled really good. I know…some of you might wonder how these ingredients all come together. Like…tomato paste and peanut butter…but it works. Just trust me. If you like Pad Thai…you’ll appreciate this soup. That’s what it smells and tastes like…minus the noodles and chicken and all that stuff. I got this recipe from Cookie + Kate…and it was a flavor sensation of pure perfection. Add the onion, ginger, garlic and salt. Cook on medium-low heat for 20 minutes. 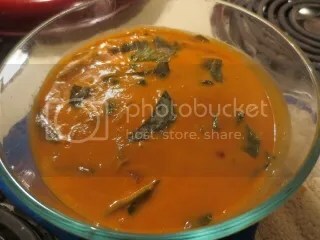 In a medium-sized, heat-safe mixing bowl, combine the peanut butter and tomato paste, then transfer 1 to 2 cups of the hot stock to the bowl. Whisk the mixture together until smooth, then pour the peanut mixture back into the soup and mix well. Stir in the collard greens and season the soup with hot sauce to taste. Serve over cooked brown rice if you’d like, and top with a sprinkle of chopped peanuts. Like I said…it’s like liquid Pad Thai. And I love Pad Thai. It sounds odd…but trust me…the flavors are there. You can make it as mild or as spicy as you want. I kept mine near the middle, because while I love spicy foods, my roommate is a “heat wimp” (her words). So…I found the happy medium there. This soup is just delicious and honestly…couldn’t be easier to make. It didn’t take much time to get the ingredients ready and then you just let it cook, stirring every now and again. I do recommend using chunky peanut butter. It is just awesome. So…if you are looking for a different soup to try…totally give this one a shot. I promise…you’ll like it. You might even love it…like me.